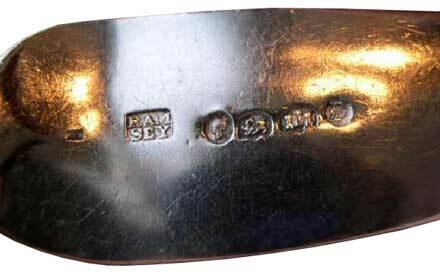 Edward Ramsey's silverware was assayed at Exeter between 1840 and 1859 - his mark was the letters RAM over the letters SEY. Ramsey made a variety of artifacts including silver objects, swords and even pocket watches - all of which are now very collectable. 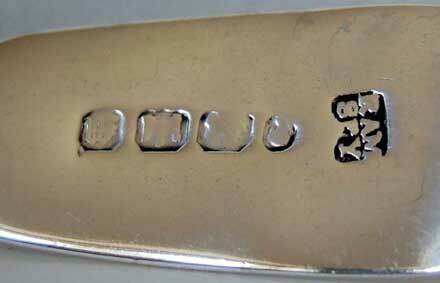 Another Devonport silversmith named Jonathan Ramsey was possibly Edward Ramsey's father (or brother?). Although this is unconfirmed Pigots 1830 reference to Jonathan Ramsey and Robsons 1839 reference to Edward Ramsey both give the same address, 51 Fore Street. 1830 Pigot & Co Directory of Devonshire. Devonport Silversmiths. Ramsey Jonathan, 51 Fore Street. 1839 Robsons Directory of Devon. Ramsey Edward, Goldsmith & Jeweller, 51 Fore Street. 1844 Pigots Directory of Devon. Ramsey Edward. 54 Fore Street, Jeweller and Silversmith. 1847 Williams Commercial Directory. Ramsey Edward. 54 Fore Street, Jeweller. 1852 Brendans Directory of Plymouth and District. Ramsey Edward. Goldsmith & Jeweller, 54 Fore Street and rear of 12 Tamar Terrace, Stoke. Whilst I have recorded facts such as the date of sale, the price achieved &c. the 'description' of each item below was that description as provided by the seller at the time - these are not descriptions as provided by Devonport Online. * Thank you to the various Ebay sellers for giving permission to use their photos, it's appreciated. 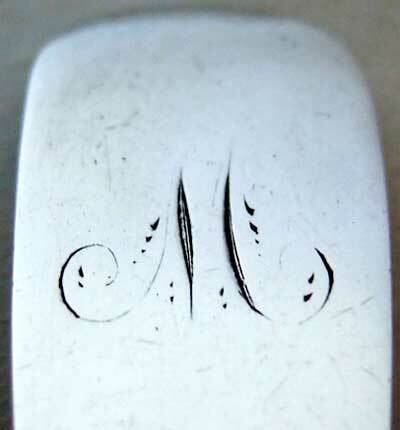 Hallmark: Fully English hallmarked, Lion Passant (guaranteeing Sterling 925 standard Silver), letter Gothic ‘D’ for the year 1840, the Assay Office mark for Exeter and the maker’s mark “RAMSEY” for Edward Ramsey. 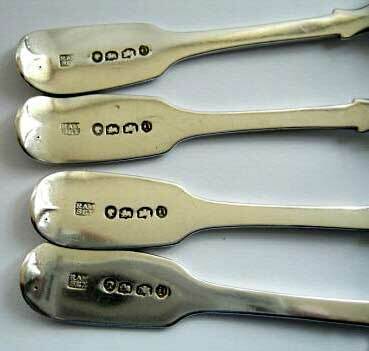 This set of four Solid Silver monogrammed egg spoons of a FIDDLE pattern, is in excellent condition with only minor surface scratches. There are no damage/cracks, no repairs and no kinks/twist. The bowls have no dimples and the rims have no signs of wear or distortion. The monogram (letter ‘S’) and the deeply struck hallmarks are clear. The maker, the silversmith Edward Ramsey, traded from 1840 to 1860 at his workshop in Devonport and assayed his work at the Exeter Assay Office. 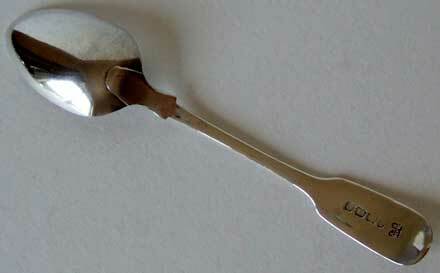 A silver dessert spoon assayed in Exeter and bearing the date letter code for 1840. The maker clearly impressed as RAMSEY. It has the initials P.D engraved to the handle. 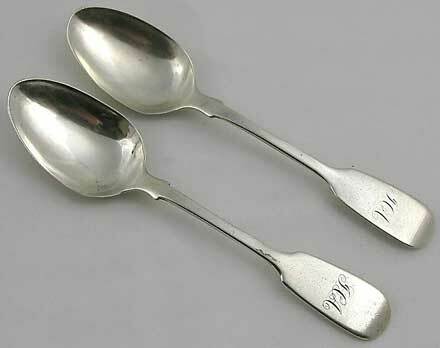 Hallmark: both spoons hallmarked for Exeter 1845. 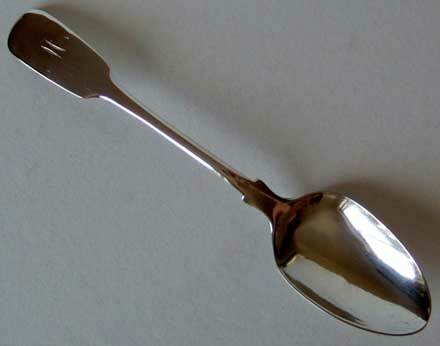 Size: each spoon is 216mm long (8 1/2 in approx). 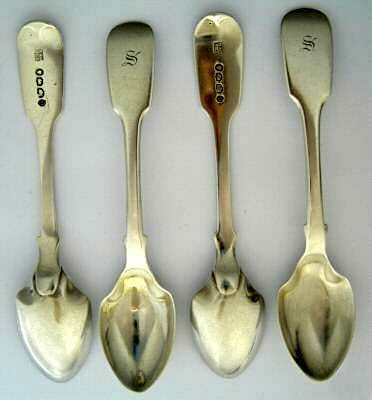 Weight: each spoon is 85gms (2 3/4 troy oz approx). Condition: Both spoons, no damage or repairs with some surface scratches. Two spoons from the same set, one priced at £30 the other at £35 - neither spoon sold. Maker Edward Ramsey. Weight: The ladles weigh 5.35oz in total. 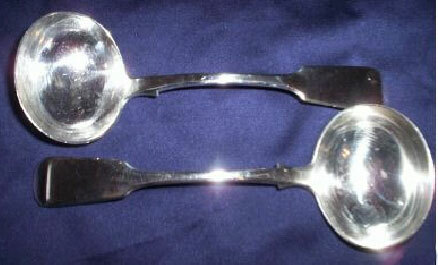 Superb pair of Fiddle Pattern Silver Sauce Ladles by Edward Ramsey 1846. Edward Ramsey was a silversmith who workrd in Devonport. These ladles are in superb condition having no dinks or dents and the bowls show virtually no wear for ladles over 150 years old. The ladles bear no monograms and the marks to the back are in excellent order. . This item forms part of the National Maritime Museum collection, London. Introduction to their description is below, please see the NMM website for full description. 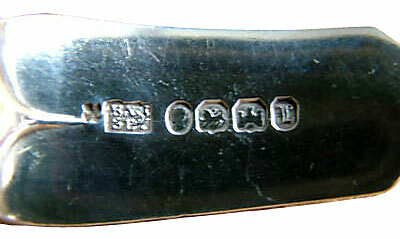 Hallmark: Each is hallmarked on the reverse of the handle with RAM over SEY, Victoria duty mark, three towers, lion passant (sterling silver assay mark), L showing that each was hallmarked in Exeter 1847. Size: Each measures over 5 3/8" long and is almost 1 1/4" across its bowl. Weight: Each spoon weighs 17.9 grams - a total of almost 1 1/4 troy oz. Condition: very good condition with just the usual surface scratching than you'd expect for their age and no dinks or dents, less than the usual dimpling to the bowl and less than the usual wear to the leading edges - SUPER condition. 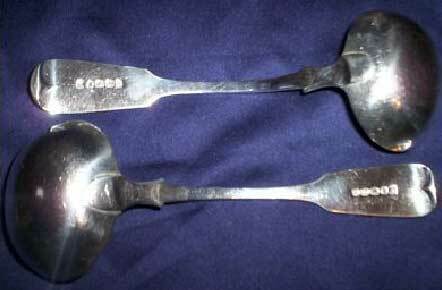 This is a lovely rare PAIR of EARLY VICTORIAN PROVINCIAL solid sterling silver tea or coffee spoons whichwas made, in Devonport, England in 1847 by the illustrious Georgian West Country silversmith, Edward Ramsey. They are in the Fiddle pattern. 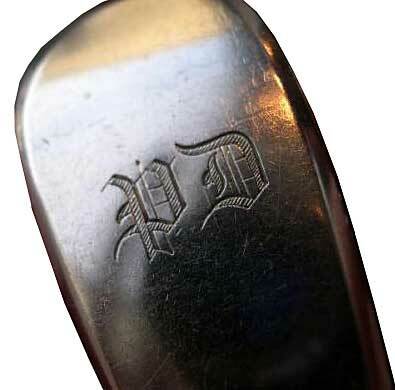 Each spoon is engraved to the handle with the initials JCA. I have shown the hallmark so that you can make up your own mind. A rare pair of Victorian tea spoons from an illustrious West Country silversmith in SUPER condition after over 160 years. Hallmark: Hallmarked Exeter 1847 (Queen`s head duty mark, lion passant, town mark and date letter "L"). Condition: No damage or repairs, no distortion and no real signs of wear. 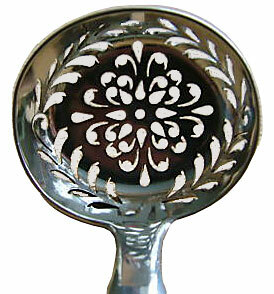 Fiddle pattern, solid silver sugar-sifter spoon with prettily pierced oval bowl. Maker is Edward Ramsey (RAM/SEY) an unusual way of spelling the maker`s full surname in a maker`s mark as opposed to the normal use of initials only. He worked from 1840 to 1859. No owner`s initials. An interesting sterling silver Victorian tea spoon by the Devonport maker Edward Ramsey. The hallmarks are a little rubbed but readable. A collectable spoon - not an easy find. Faces/movements spares/repairs Inc. Nice fusee signed movement Edward Ramsey Devonport. 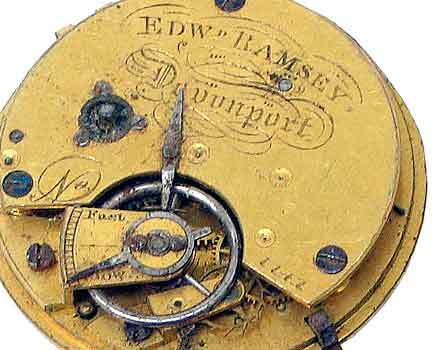 This auction is for 19th century pocket watch dials and movements, all for spares or repairs. This is a fusee movement, looks nice and old. Serial # 1141. Dial is good, just needs a clean, and movement is complete.